Today we were on our way to Riebeek Kasteel for a weekend away. On our way there we drove past Vondeling and I decided to stop for a tasting as it had been a few years since I last tasted their wine and my boyfriend had not been there before and I wanted to show him the place. The place was quite busy. I found out that they had recently done a Groupon special where you can have lunch and wine tasting for a special price. The meal looked scrumptious and I was envious of all these Groupon customers! On arrival the staff were very welcoming and polite. We were lead to the bar/counter to do the wine tasting and then Marian came to conduct the tasting with us. The tasting room here is humble and lovely. 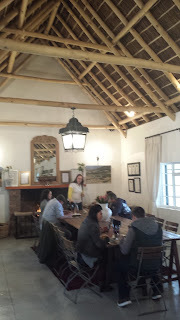 As it was during the winter months the fire place was going and everyone was happy to be inside. The church is now finished making the venue even more ideal for a wedding, not to mention the views. There is a lovely outdoor area at the tasting room with views over the vineyards with the mountains in the not far distance. 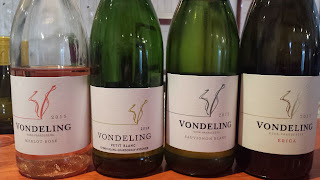 Vondeling has a lovely range of wines and they are fairly priced. I can highly recommend coming out to Vondeling for a tasting. I am sure you will enjoy the charm, warmth and kind hospitality that the staff show here. Vondeling Rose 2015 - 100% Merlot Rose. Pronounced nose, nice viscosity, red berries on the palate. Great fruit flavour with some spice. Very nice. R49.50 a bottle. Vondeling Sauvignon Blanc 2015. Sweet tropical fruit aromas including guava and gooseberry. It has intense flavour and reminds me of a NZ Sauvignon blanc. A lovely wine! R65 a bottle. These first three wines turned out to be my favourite from the range. They are great value for money; you can't go wrong with these wines! Vondeling Chardonnay 2013 - buttery, honey, butterscotch, heavy. 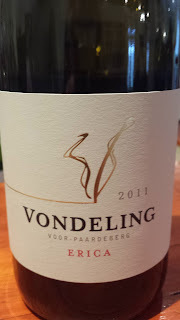 Vondeling Chardonnay 2014 - light aromatics, fresh, lighter in style to the 2013, pleasant. Vondeling Barbera 2013 (flagship white) - 60% Chenin Blanc, 15% Grenache Blanc, 15% Viognier and 10% Chardonnay. 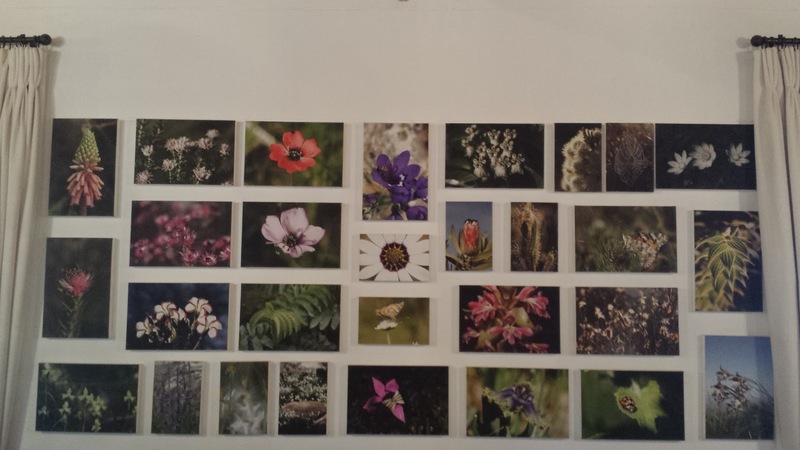 Babiana is named after a flower on their property which is endemic to the area. 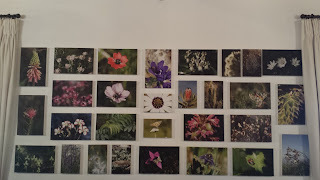 When you visit this winery, you can see a photo of this flower on the wall. This wine has good body, has a slight waxy texture/mouth feel. Stone fruit flavour. This is a good wine. R135 a bottle. Vondeling Petit Rouge 2014 - 85% Merlot and 15% Cabernet Sauvignon. Medium intensity on the nose, black fruit flavours, good tannin structure, liquorice. Good depth in flavour. R49.50 a bottle. Vondeling Baldrick Shiraz 2013 - 93% Shiraz, 6% Mourvedre and 1% Viognier. I wasn't a fan of the nose on this wine, it had a slight earthy/manure smell. It had good depth in colour, was smooth and had good concentration in flavour. More along the lines of dark fruit flavours. Tannins are present. R70 a bottle. Vondeling Erica Shiraz 2011 - 86% Shiraz, 10% Grenache Noir, 3.6% Mourvedre and 0.4% Viognier. This had a beautiful (and pretty) nose, with some sweet notes of vanilla. It was spicy, a little dry (tannins) but not harsh or undrinkable. Violets and floral tones. R139 a bottle. Vondeling Cabernet Sauvignon 2012 - lovely red fruit aromatics, with some slightly sweet spice and cigar hints on the nose. Lovely ripe fruit flavour, dry, and a little bit of spice. R102 a bottle. After reading my previous post on this wine estate, I feel this one doesn't do it enough justice, in regards to the charm and warmth of this place. Please do read my post from the first visit as I hope it will encourage you to make the journey out to this estate. 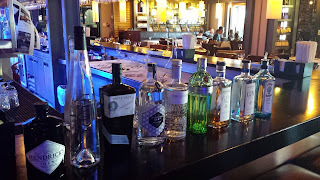 Today I joined two others in a Gin tasting to see how the gins I have from overseas compare to what we can get locally here in South Africa. I have looked online for retail prices and then exchanged them in to Rand at today's exchange rate. I thought it would be good to see how they differ in regards to price. - Had a candy character on initial taste and heaps of liquorice on the finish. Lingered for a long time! - What really showed on this in comparison to the others is the texture. It was much thicker in consistency than the others. More floral on the nose. Candy, cucumber and botanicals on taste. - Cucumber on the nose. Citrus/marmalade on taste. - Prominent butterscotch on the nose. Good viscosity but not as much as Hendriks. - not offensive on the nose or palate. Definitely the best sipping gin. - pleasant nose, good viscosity, candy and citrus flavours. - Citrus on the nose, nice viscosity, spearmint, alcohol wasn't offensive. - like a slap in the face after the other gins. Not offensive on the nose however. - Cola on the nose. This was a fun exercise! It was nice to be tasting something other than wine and to sit down and really understand the characteristics of gin. It seems the Uncle Vals which we only had a shot left of, was the favourite. Sadly I can't get more of that unless I go back to the US or someone brings me a bottle. The Woodstock was a stand out gin. The Botanist showed as the best sipping wine, the South Gin was a favourite in flavour, and the Hendriks won on viscosity. The Inveroche showed well against all these gins and made us proud to have a high quality local gin on the market. The Bombay was very much out of place! I would love to get some more gins and do this again in a year's time. I wonder what wonderful gins we can find by then. It might be quicker, easier and cheaper to hit Mother's Ruin in Cape Town! ?